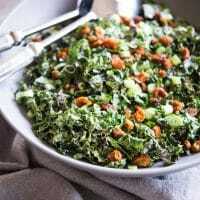 Place the chopped greens in a large mixing bowl and set aside. Whisk all the ingredients together until smooth. If it’s too thick, add one teaspoon of water at a time until it thins to your liking. Taste and add additional salt/pepper as you like. Note: the thickness variation is due to a variation in tahini consistency. Pour the dressing over the kale and massage it in. Transfer the salad to your serving bowl, garnish with the berries, chopped onion, and enjoy!